Mykaila began dancing at the age of three and trained in all styles at the Linda Jamieson School of Dance in Ottawa, Canada. Upon graduating high school, she moved to New York City to attend the prestigious Ailey School to further her dance training. Immediately after finishing her 3-year program, Mykaila starred in The Musical CATS as Victoria on Royal Caribbean’s Oasis of the Seas. 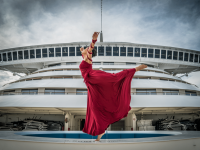 What’s Life Like for a Cruise Ship Dancer?